T-Shirt Gun Hire for indoor and outdoor events across the UK and Europe. The Micro-Mini T-Shirt Launcher is under 2kg and is perfect for short range action, being easily portable and easy to reload. 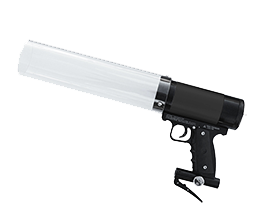 These amazing quality american handheld T-Shirt guns are ready for hire here in the UK and Europe as full kits. Offering One-Button Operation with no external hoses or rigging the built in cylinder enables the user to move freely of ease of use. 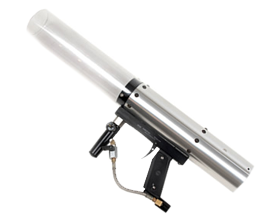 This T-Shirt Cannon Launcher can throw T-shirts distances up to 150ft (45m), the Micro-Mini™ is a easy to use option using CO2 to operate. Perfect for use on events such as, corporate events, trade shows and concerts, outdoor festivals or sporting events. With ForceFX we make T-Shirt Gun Hire easy sending everything you need and providing information on the gas required. Bigger and better we introduce the Bleacher Reacher pro available to dry hire or available with a technician. At just under 7lbs, it shoots to the top deck of most arenas and stadiums. Our T-Shirt Gun Pro has a variable range of 20 - 100m, built-in regulator, pneumatic trigger, real-time velocity control gauge and large bazooka style barrel. Perfect for use on events such as, corporate events, trade shows and concerts, outdoor festivals or sporting events. With ForceFX we make T-Shirt Gun Hire easy sending everything you need and providing information on the gas required.